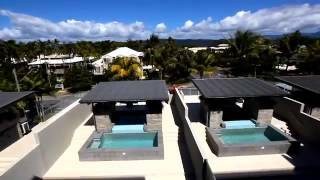 A heavenly retreat awaits at Coconut Grove Apartments Port Douglas - one of tropical north Queensland's most impressive interpretation of luxurious Port Douglas accommodation. Situated in cosmopolitan Macrossan Street, just 140 metres from magnificent Four-Mile Beach, divine views of rainforest mountains can be enjoyed in absolute privacy from a choice of 33 glamorous holiday apartments. Fully contained and complete with their own outdoor entertaining terraces which extend seamlessly from sophisticated living areas - their Terrace Pool, Balcony and Penthouses are so self-contained, you will never want to leave. For guests, the ultimate indulgence awaits when they opt for a rooftop Penthouse or Terrace Pool Apartment, incorporating its very own swimming pool, spa and outdoor entertaining facilities. As a holiday destination, Port Douglas is in a class of its own - a paradise found for the most discerning visitor craving relaxation with a certain je ne sais quoi. Chic boutiques, cool eateries, restaurants and internationally celebrated resorts and golf courses are the perfect foil to nature's veritable patchwork of World Heritage listed rainforest, verdant cane fields and Coral Sea. Beautifully spacious the Terrace Pool Apartments are situated on one level. Perfectly suited to families, master bedroom with walk-in robe and luxurious spa bathroom. With tranquil sleeping areas well separated from the kitchen and living room with plasma television and audio system, children may rest while the parents kick up their heels or entertain friends. Comprehensively fitted out with laundry, full kitchen with European appliances, dining facilities and outdoor entertaining, guests will also fall in love with their own outdoor terrace that blends seamlessly with the indoors. Add to that, its own barbecue cooking area, dining table and swimming pool. This is how the other half live - in one of Coconut Grove's penthouse apartments, set over two levels. Entertain friends on the rooftop terrace and drink in sublime mountain views between cooling dips in your private pool and spa. Each apartment incorporates twin, queen and master bedroom with walk-in robe and spa bathroom. Taking cue from the palest marine-based hues the interiors are interpreted in a natural palate, for an overall feeling that is cool and completely calm. The kitchen and living areas have been created to be the centre of enjoyment. The thoughtfully laid out kitchen comprises luxury Miele kitchen appliances with everything provided for elegant entertaining to ensure guests will want for nothing during their time at Coconut Grove. Beautifully spacious the Terrace Pool Apartments are situated on one level. Perfectly suited to families, each incorporates three bedrooms in twin, queen and master with walk-in robe and luxurious spa bathroom. With tranquil sleeping areas well separated from the kitchen and living room with plasma television and audio system, children may rest while the parents kick up their heels or entertain friends. One two and three bedroom tariffs available. Guests will luxuriate in their spacious Balcony Apartment; master bedroom with walk-in robe and luxurious spa bathroom. Situated at the heart of the apartment is a well-appointed kitchen featuring European appliances and living area with plasma television and audio system that beckons the outdoors in as it flows onto the expansive sun drenched balcony with barbecue and entertaining facilities. Guests will luxuriate in their spacious two-bedroom Balcony Apartment; each incorporates two bedrooms in twin or queen and master with walk-in robe and luxurious spa bathroom. Situated at the heart of the apartment is a well-appointed kitchen featuring European appliances and living area with plasma television and audio system that beckons the outdoors in as it flows onto the expansive sun drenched balcony with barbecue and entertaining facilities. This is how the other half live - in one of Coconut Grove's penthouse apartments. Entertain friends on the rooftop terrace and drink in sublime mountain views between cooling dips in your private pool and spa. Master bedroom with walk-in robe and luxurious spa bathroom. Taking cue from the palest marine-based hues the interiors are cleverly interpreted in a natural palate, for an overall feeling that is cool and completely calm. The kitchen and living areas have been created to be the centre of enjoyment. The thoughtfully laid out kitchen comprises luxury Miele kitchen appliances with everything provided for elegant entertaining to ensure guests will want for nothing during their time at Coconut Grove. Guests will luxuriate in their spacious three-bedroom Balcony Apartment; each incorporates three bedrooms in twin, queen and master with walk-in robe and luxurious spa bathroom. Situated at the heart of the apartment is a well-appointed kitchen featuring European appliances and living area with plasma television and audio system that beckons the outdoors in as it flows onto the expansive sun drenched balcony with barbecue and entertaining facilities. Enjoy one of Coconut Grove's three bedroom penthouse apartments, set over two levels. Entertain friends on the rooftop terrace and drink in sublime mountain views between cooling dips in your private pool and spa. Each apartment incorporates twin, queen and master bedroom with walk-in robe and luxurious spa bathroom.